My mother-in-law posed this question as after-dinner conversation a few weeks ago: “I don't see why you like Edward Gorey so much. Why do you?” After 21 years, I assumed she already understood why I devoted so much time and energy to his books and his artwork, so I was ill-prepared for such a fundamental question. Why do I like Gorey? Why do I like Life? Answers to these aren't so ready-made, not for me at least. Maybe I was busy digesting the food and wine, unable to snap up the resources to digest her question. I smiled and replied "there are so many things I like about his work." But I didn't follow up with that long list of reasons I know are buried deep within my well of souls. Anyway, she already moved to the next topic. I suppose she really didn't want to know. Had I had Gorey's Worlds, published by Princeton University Press and the Wadsworth Atheneum Museum of Art, nearby, I would've just handed it to her. “Read this,” I could’ve said, “I think you might understand more than I can explain”. To someone who doesn't 'get Gorey', and there are a fair number of them, his work seems anything but serious, neither of vast canvas nor heavy, epic novel. Gorey's works are often small, mostly black and white and cloaked in humor and pathos. His abecedarian works are excellent examples: broad, proverbial statements made about life, delivered ironically in often miniscule, condensed or minimalist media. 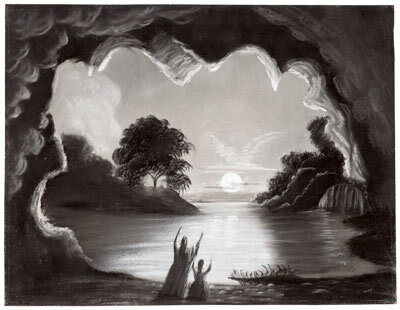 For me, this makes Gorey's work both appealing and intimate in nature. Wadsworth Atheneum Museum of Art, Bequest of Edward Gorey, 2001.13.2. Be that as it may, the real treat here in 'Gorey's Worlds', a handsomely-designed hardcover book produced in conjunction with the Wadsworth Atheneum exhibition, is the collection of essays examining the worlds Gorey immersed himself: the works of art that he enjoyed and his favorite entertainment – ballet. 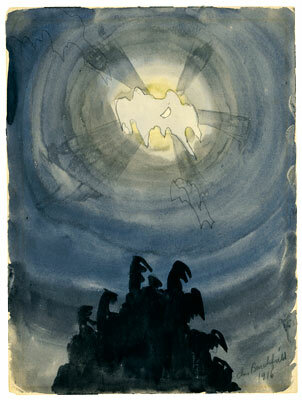 The book also explores a specific aspect of Gorey’s own art work and his writing style in general. When Edward Gorey quietly bequeathed 73 items from his personal art collection to the Wadsworth Atheneum Museum of Art, it left them the task of divining the unseen streams linking Gorey’s output as artist, to the art works he collected. Not to mention why he might have chosen the Wadsworth as the final guardian of his art collection. Erin Monroe, a curator of American Painting and Sculpture at the Wadsworth, provides a few eye-opening perspectives about several key elements found in Gorey's fine art collection, particularly photographs by Eugène Atget and works by Charles Burchfield. Friend Robert Greskovic, dance critic for the Wall Street Journal, brings to life the effect George Balanchine and the New York City Ballet had upon Gorey. The chapter is immediate, insightful, and serves up some choice observations and anecdotes. For example, who else could quote Balanchine lamenting: "There is this man who comes all the time, but never sees the ballet, only sits in the lobby to read and write." Who could he be referring to? Would Balanchine’s vision ever be altered by the facts? Wonderful. City Ballet. New York: Gotham Book Mart, 1973. Pen and ink on paper. 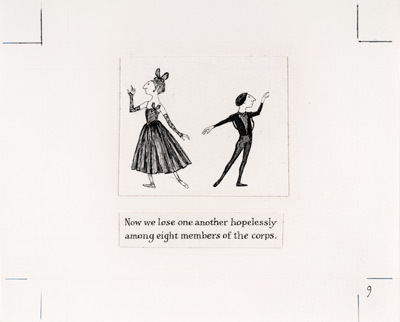 © The Edward Gorey Charitable Trust. Arnold Arluke, a Senior Research Fellow at the Tufts Center for Animals and Public Policy, gives an analysis of the creatures large and small commonly seen populating Gorey’s art. Kevin Shirtsleeve, a Professor of English at Christopher Newport University, finds many reasons to consider Gorey’s writing a distinct vein of the Surrealist and Nonsense genres. Together with contextual photographs of Gorey and the fine reproductions of dozens of the art pieces Gorey called his favorites, this book, itself a valuable supplement to this travelling exhibition, helps carry Edward Gorey into the future, not just as a talented artist and author who created compelling art in the form of the Book, but as a curious individual, willing to let himself freely marvel at the world around him. Charles Ephraim Burchfield, Nature’s Mystic Spiral, 1916.